Yesterday was the first day of autumn…cooler temperatures, changing colors of the leaves, comfort food! 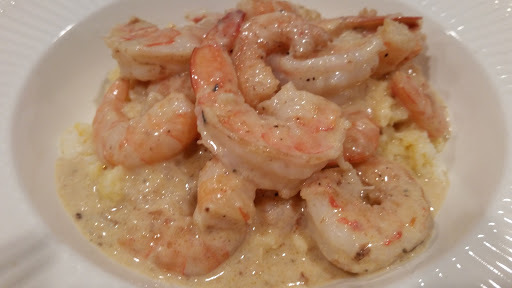 What could be more comforting than a large bowl of shrimp and grits! This recipe requires a little extra time but it is so worth the effort. It is my FAVORITE and most requested recipe. Begin by peeling and deveining the shrimp. Place the shells in a medium sized pot to be used for the sauce. You may leave the tails on the shrimp or remove them. It makes a prettier presentation to leave them on but my family prefers them off. Pat dry the shrimp, sprinkle with salt and pepper, and refrigerate until you are ready to cook them. Next, prepare the stock for your sauce. 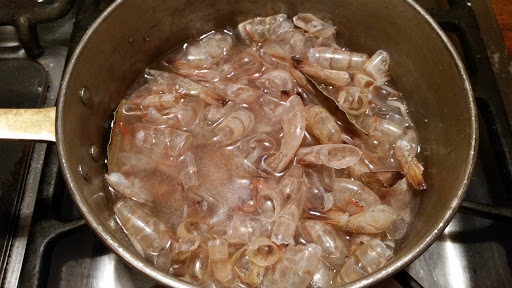 To the pot containing the shrimp shells, add 2 cups of chicken stock, 2 bay leaves, a pinch of sugar, a pinch of cayenne pepper or red pepper flakes, salt and pepper. 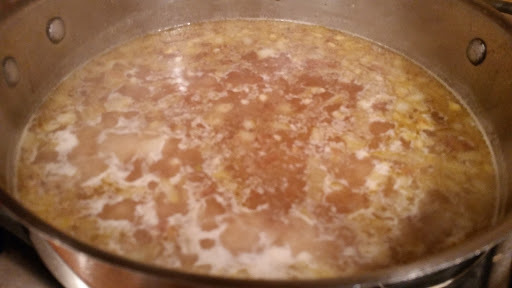 Bring to a boil, reduce heat and simmer until the stock has reduced by almost half. This will take approximately 15-20 minutes. While your stock is simmering you can make your cheese grits. Guess who forgot to make pictures of the process?? I really have to work on that! I will explain how I made mine though. In a heavy bottomed pot add the milk and butter. Over medium heat, scald the milk until the butter is melted. Do not let this come to a boil. You want to see tiny bubbles around the sides of the pot. Slowly whisk in the grits to avoid clumping. Add salt and pepper to taste. Reduce the heat and let the grits cook until tender and creamy, stirring frequently. This will take 8-10 minutes. Remove from heat and add the cheese. Stir well and cover until ready to use. And now for the shrimp! In a large frying pan, heat the butter and olive oil. Place the shrimp in a single layer and cook until the shrimp turns pink. You will need to turn once. This will only take 2-3 minutes. Remove the shrimp to a plate and continue cooking the remainder of the shrimp. Add the onion and garlic to the pan and saute until the onion becomes tender, about 5 minutes. Strain the shrimp stock removing all the shells and bay leaves. Add the stock to the pan scraping off all the goodies that remained on the bottom of the pan. Take 3 tablespoons of your stock from your pan and mix into 2 tablespoons of flour. Make sure all the lumps are gone so you don’t end up with lumps in your sauce. You may have to add a little more stock to achieve this. Whisk this into your sauce and allow it to cook until the sauce has thickened slightly. If you prefer a creamier sauce, add 1/4 cup heavy cream to the sauce at this point and allow it to cook for 3-4 minutes. You won’t regret it…trust me! Remove the sauce from the heat and stir in the shrimp. It’s time to plate it and EAT!